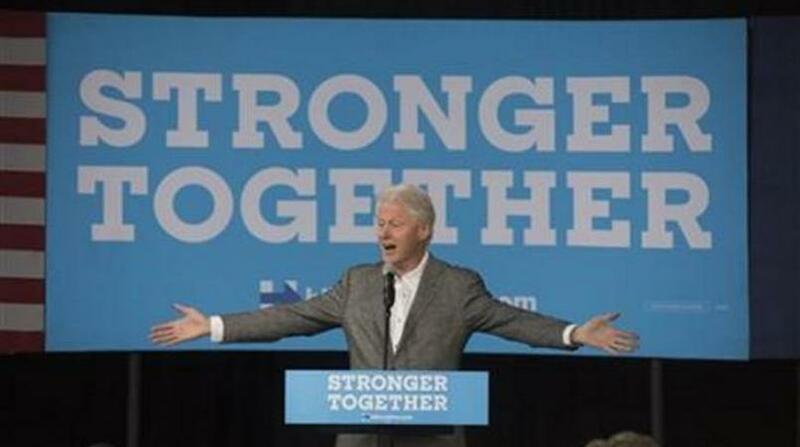 Bill Clinton is trying to avoid muddling his message again as he campaigns for his wife in battleground Ohio a day after he described President Barack Obama's signature health care law as "the craziest thing in the world." The former president made no reference Tuesday to those earlier statements, even as they continued to reverberate, prompting responses from the White House and his wife's top aides. His relationship with a White House intern was the subject of his 1998 impeachment. Bill Clinton did not respond to specific questions about Trump's recent suggestion that Hillary Clinton also was not "loyal" to her husband. John Podesta, Hillary Clinton's campaign chairman, tried to tamp down any controversy over his health-care riff. "We need to fix the problems, and I think that's what President Clinton was referring to," Podesta said. In Ohio, Bill Clinton told the mostly student crowd Tuesday that Hillary Clinton supports a so-called "public option," a government insurance plan to compete alongside private plans marketed in Affordable Care Act exchanges. "President Obama has of course acknowledged that with cooperation from Democrats and Republicans in Congress, there are some things that could be done to further strengthen the law," Earnest said, "and you know, that's something that Secretary Clinton has vowed to pursue if she is elected president of the United States, and President Obama is certainly going to do everything he can to support that effort." In Ohio, Bill Clinton deflected a heckler early in his remarks. As he began to speak, a man yelled at the former president for signing a 1994 crime law that included stiffer sentences for many federal crimes. Clinton told the man "Hillary didn't vote for the crime bill," but noted "Senator Sanders" did, referring to Vermont Sen. Bernie Sanders, who challenged Hillary Clinton for the Democratic nomination. Clinton's overall remarks focused on why Hillary Clinton would be better for the economy than Trump, who Bill Clinton described as playing on working class voters' economic frustrations with lies and empty promises. FEATURED IMAGE CAPTION: Former President Bill Clinton speaks to a crowd at the Dow Event Centre in Saginaw, Mich. while campaigning for his wife, presidential candidate Hillary Clinton, on Monday, October 3, 2016.